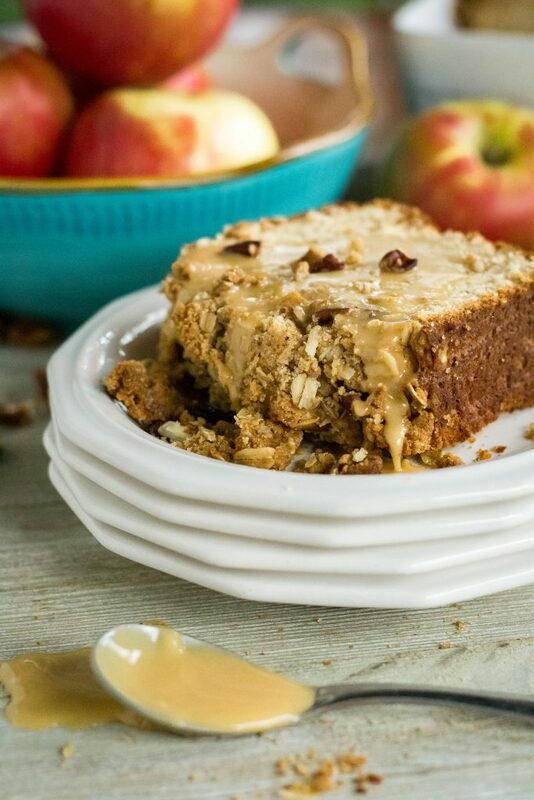 Apple Crisp Quick Bread - What the Forks for Dinner? Back in June, I made a quick and easy one bowl breakfast bread. One Bowl Blueberry Breakfast Bread was the perfect summer bread….light and full of blueberries. 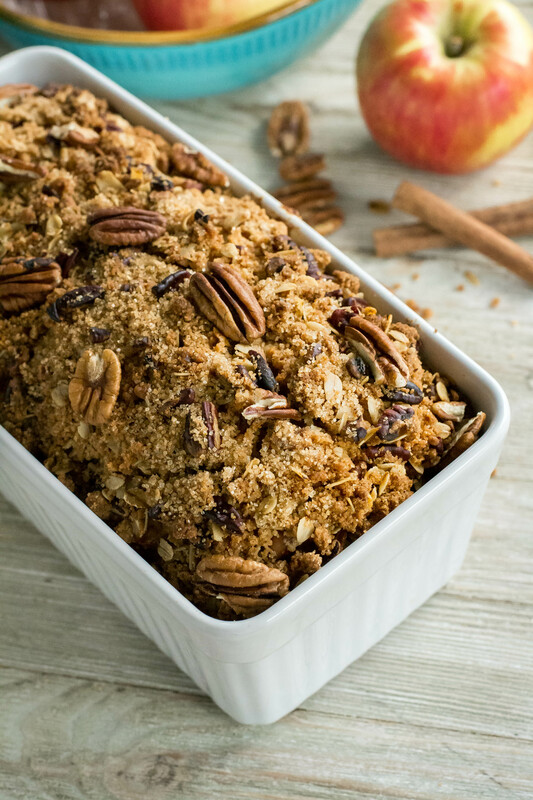 But fall is at hand and it’s time for apples…… Apple Crisp Quick Bread ……. apple crisp topping on a one bowl quick bread. Fall is my favorite time of year. Mornings are crisp and cool, sun warms the daytime hours, and in the evening, there is just enough of a chill in the air for sweatshirts. It’s also time to get back to baking. Apples, next to pumpkin, are a top fall staple. Apple pie, caramel apples, and my all time favorite, apple crisp. 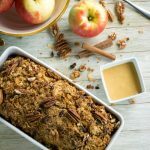 Apple Crisp Quick bread combines the crunchy, crispy topping of apple crisp with a warm fresh out of the oven bread. Switching up my One Bowl Blueberry Breakfast Bread was easy. Apples replaced the blueberries, and a touch of cinnamon gives that warm fall feel. The topping is what really makes this bread. Classic crisp ingredients….flour, brown sugar, and butter along with oatmeal, and pecans…perfection. This topping can also be used for a traditional apple crisp. If you read Tim and I’s blog, you know that if I can top something with turbinado sugar, I am in heaven. Turbinado sugar (raw sugar) is a minimally processed sugar. It comes from the first pressing of cane sugar, so it retains more flavor. Turbinado sugar used in or for a topping gives a light molassey flavor with a crunchy texture, as it doesn’t dissolve or melt….it’s perfect! Caramel and apples are a match made in heaven. I didn’t want the caramel in the bread, but it sure could go on top. A simple glaze of powdered sugar, butter, and caramel ice cream topping. The glaze gave extra sweetness to the bread and….well it was caramel ….enough said! Since it’s just Tim and I, and everything I make seems to have endless leftovers, I try to get creative in ways to use the leftovers. Apple Crisp Quick Bread was wonderful still slightly warm from the oven with the caramel glaze. Forward to the next night. Pop a slice in the microwave, add the glaze, and whipped topping……dessert. The following day, sticking with the dessert theme, ice cream on a toasted warm slice of Apple Crisp Quick Bread. Do not put this bread in the toaster, the crumbs will burn and it will be all over the place. Instead spray a slice of the bread with non stick cooking spray and place in a preheated skillet…..like grilled cheese….only no cheese. 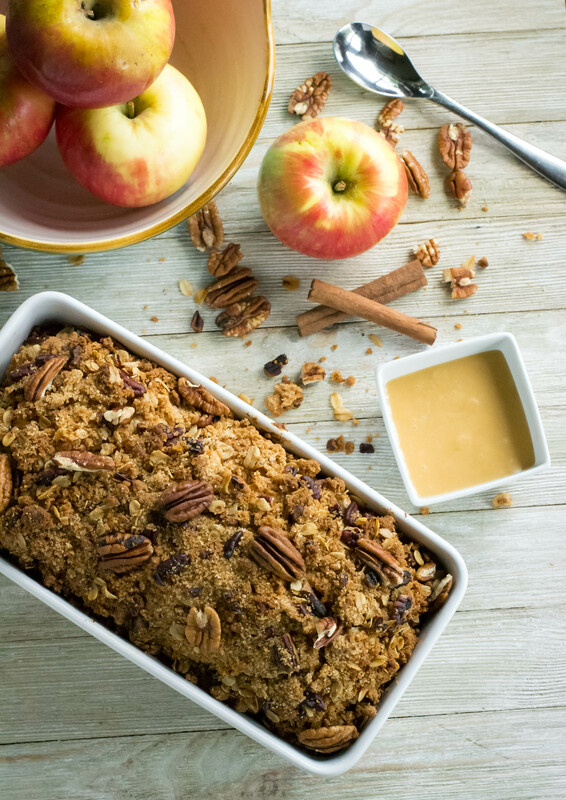 From breakfast to dessert, Apple Crisp Quick Bread will be one of your fall apple favorites!! 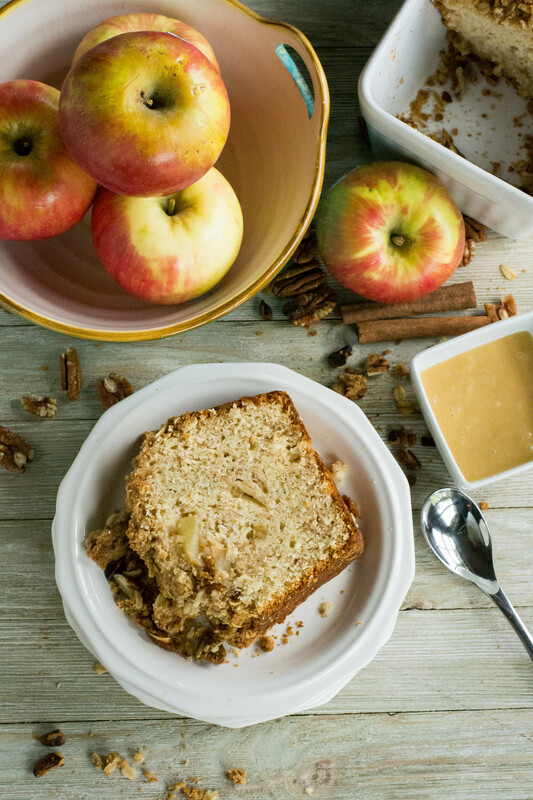 Easy one bowl apple quick bread with a traditional apple crisp topping. 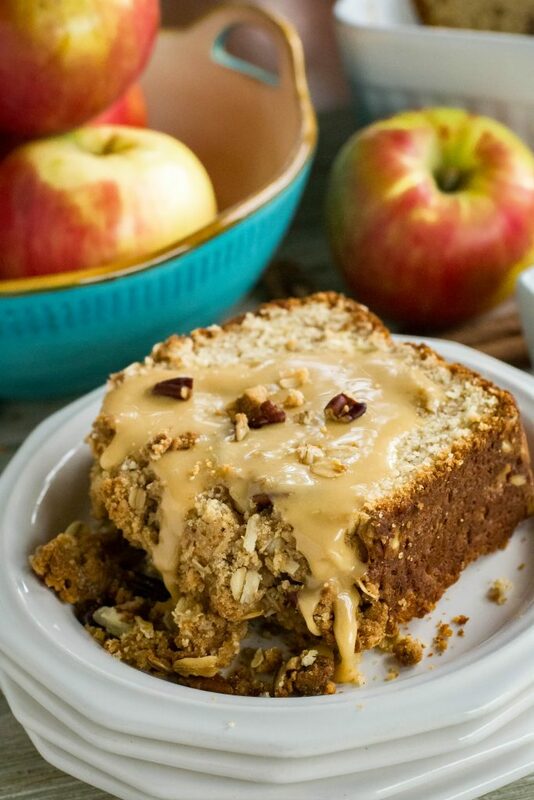 Caramel glaze and its the perfect fall quick bread!! Preheat the oven to 375°F. Spray a 9×5-inch loaf pan with baking spray line with a couple of strips of parchment paper. In a large bowl, whisk together the yogurt, eggs, melted butter, and vanilla, then fold in the flour, sugar, baking powder, cinnamon and salt ( you can mix these in another bowl before to add them to the wet mixture). Mix in the oats. Gently fold in the apples The batter will be thick and slightly sticky. To make the topping; mix the flour, brown sugar, cinnamon and pinch of salt in to a medium size bowl. Cut in the 4 tablespoons of butter until crumbly. Stir in the oatmeal and pecans. Place the batter into the prepared loaf pan and top with topping mixture, then sprinkle the turbinado sugar over the topping. Bake for 55-65 minutes or until golden brown and when a toothpick inserted into the bread comes out clean. Remove bread from the oven and let cool in the pan for 10 minutes. Using your parchment paper remove the bread from the pan and transfer to a wire rack. To prepare the glaze; in a small bowl combine the powdered sugar, butter, and 2 -4 tablespoons ice cream topping depending on the amount of flavor you want. Serve warm or at room temperature with glaze.